"Henry L. Foss's Three Compasses"
Henry L. Foss's Three Compasses. The first compass has a loop with string,"Magnapole, Reg US Pat Office" Short & Mason" Taylor-Rochester" "Pat. Apr. 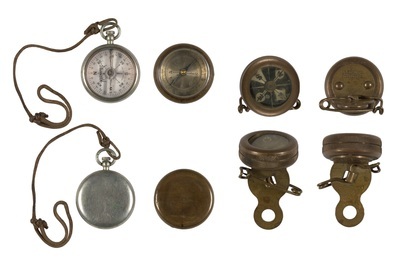 20-1915"; The second compass has no identifiable marks; The third compass, a pin, is signed "L L BEAN Inc. Freeport Me."